I feel so relieved. 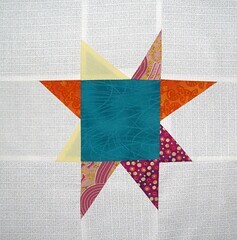 I am finally all caught up with my virtual quilting bees. I joined a second bee that started this month, so now there is two! I am really happy to be all caught up with my original bee, Bee Pieceful. 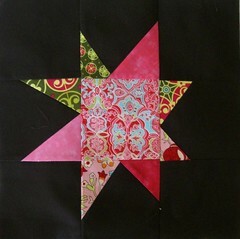 January’s – maverick (wonky) star – she sent some fabrics she got in Australia – I was so nervous about making a mistake. I’m so glad I didn’t. I think it looks kind of aboriginal. 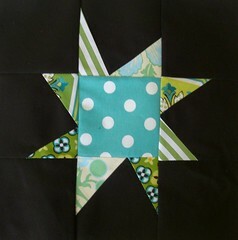 My new bee is called The Block Swap and this month’s bee wanted wonky stars as well. I like making them so it was a fun month. 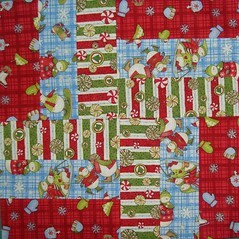 She just sent the center square and the background fabric, so I had to fill in with my own scraps to make the points. The blue one is my favorite. My month for Bee Pieceful is March, so I need to decide what fabrics I want to send out. 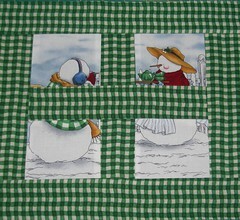 I am thinking some 30s-40s reproductions, because these ladies are so talented and I know they would make some really beautiful blocks with that fabric. Also, if you do not read Handmade by Alissa, she is helping to organize Modern Quilt Guilds in cities all over the country. I volunteered to start one up in Indianapolis, so if you live around here and are interested, please email me at janmadethis at gmail dot com.